On a recent trip to Pfeiffer beach (Summer of 2009), my daughter Pia, found this death and dried up starfish sitting on a rock quite far away from the ocean. Who knows how it got there, how long had it been laying under the blazing sun, and how agonizing its end was. What is clear is that this perfectly adapted being, now solid as a rock, did not stand a chance once it left the water. 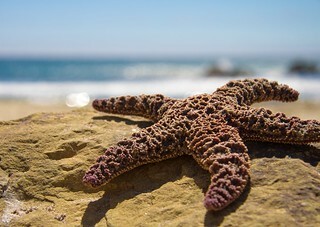 I can't help but think that our civilization has abused our planet's balance so far beyond proportion that unless each one of us takes immediate and drastic measures to revert the damage, our children who should otherwise live well into the 2080s-2100s will soon see the same fate as this lowly starfish. I recently watched "Home Project", an amazingly well photographed documentary by Yann Arthus-Bertrand about the current state of our planet, and I'm completely freaked out. What freaks me out the most is not how messed up the environment already is, or the urgency of the matter, but how blind and tolerant everyone is. I cant' believe that despite the conclusive assessments of the IPCC I still find 'educated' people who think that Global Warming is not real, is not our fault or there is nothing they can do about it. Please make some time to watch Yann's amazing documentary (click here), (enjoy the photography while you are at it), become educated and pass around some intolerance towards planet abuse.